For months, I have stood idly by, drumming my fingers on my desk and waiting for a story that could really turn journalism on its head; a story that could really change the world as we know it. Here I am thinking of Woodward and Bernstein reporting on Watergate, or Matt Drudge breaking the Lewinsky scandal. "Those guys took down a president," I think to myself. "I want a story like that." Well, fortunately, I've finally found it: I'm going to write about how a valet scratched my car. For those of you on the Pulitzer Prize committee, that's D-E-M-U-R-O, with a capital "M."
Before I get into the real meat of this story, though, I think it's important to explain valet parking. I do this for the benefit of people reading from places like Idaho, who might not understand why the simple act of going to a meal requires letting a stranger drive your car. 1. You show up at a nice restaurant that serves dishes "braised," which I believe is a fancy way of saying "cooked." 2. You open your own car door, because the valets are arguing about football, or, if you are in Los Angeles, hairstyles. 3. The valet hands you a ticket, which can be used later to retrieve your car, assuming the valet has not "lost" your keys by dropping them in a storm drain. 4. You enjoy a nice meal, completely oblivious to the fact that, while you calmly sip braised tap water, the valet is engaged in a reverse-gear drag race between your car and a Honda Pilot. 5. After the meal has ended, you come out to collect your car. 6. The valet has lost your keys by dropping them in a storm drain. The theory behind valet parking, I think, is that it's supposed to make things easier. It's as if the restaurant is saying to its customers: There there, sir. No need to go through the trouble of parking your vehicle, which we know can be a difficult, exhausting experience, right up there with modern challenges such as clearing your throat, or blinking. Instead, we'll leave all that to a 19-year-old who's wearing shorts and SnapChatting with his girlfriend for some naked selfies. And that leads us to my experience. On Sunday evening, I went to a certain Atlanta restaurant that I've been advised by a lawyer not to name, on the theory that they may retaliate by showing up at my door and making me eat more of their food. Like every other customer at the restaurant that night, I handed over my vehicle to a valet, since there's absolutely no street parking in the vicinity of this place. And then, like every other customer at the restaurant that night, I walked inside and spent the next hour shouting at my friends in a vain attempt to communicate despite the restaurant's insanely high noise level. I am told there was also a meal. At the end of the night, I picked up my SUV and gave the valet a seven-dollar tip, which I think is a fairly reasonable sum for a) driving approximately 50 feet, and b) changing my seat position. In fact, if the valet had taken my seven dollars back inside, he could've gotten himself some sort of braised appetizer, assuming the waiter could hear him place the order. Anyway: on the drive home, I discovered that little silver horse on my Ferrari key was missing. That's annoying, since the key isn't cheap to replace – but I chalked it up to a valet mistake and poor materials. The key is, after all, Italian, which means it was probably manufactured with the same attention to detail as a frat party bonfire. I moved on, left the restaurant, and didn't think about it again. Or, at least, I didn't think about it again until the next morning. That's when I noticed the damage in the cover photo: two scuffs, a deep scratch, and a shattered – and missing – tail light cover. Now, this may seem like a minor accident to most of you out there in readerland. 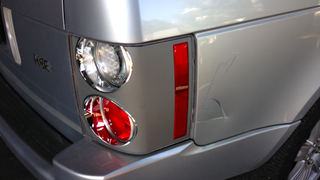 But for those of us who have experience with body shops, here's what happens: first, they replace the tail light, which costs something absurd like $950. Then, they replace the panel, which is another $950. But then they see a scuff on another panel. And another panel. And another panel. And before you know it, they've replaced your entire car, and your Carfax report shows that you were in a serious rollover accident that severely compromised the structural integrity of the vehicle; especially the part where you crushed that small child under the C-pillar. Knowing this, I immediately drove back to the restaurant, where I encountered two employees who weren't working the previous evening and had no knowledge of me, my car, or my situation. They were innocent restaurant workers, untarnished by evil, just trying to accept some morning food deliveries. Unfortunately, none of this stopped me from causing a loud scene and walking around like a raving lunatic, insisting that "they would be responsible" for my damage. At some point, I think I threatened to sue the chef. "Well, sir, the valet is a separate company." Over the last 24 hours, I've thought long and hard about things that upset me more than this sort of pathetic buck-passing, and I've only come up with three: genocide, pedophiles, and people who bring huge signs to sporting events. I would be less upset by, for example, home invaders. "Take what you want," I'd tell the invaders. "But don't tell me your getaway driver works for a separate company." Because the thing is, the valet isn't a separate company. It's part of the entire experience that makes the restaurant what it is, from the moment I arrive until the moment, several hours later, when I'm vomiting my braised appetizers into the toilet. Of course, I'm aware that the valet is technically a separate company. But so is, say, the meat vendor. If I had an issue with the steak, would the restaurant tell me to direct my complaint to their meat supplier? Would they tell me to go directly to the cow and ask why it tastes funny? Of course not. They would ask me to repeat myself, because it's so loud that they can't hear me. Fortunately, I didn't bring up all of this with the restaurant, because I probably would've become enraged a second time and threatened to sue the wall decor. Instead, I ran out to the parking lot and began searching for shards of my taillight cover while the restaurant employees dialed the valet company. Speaking of the valet company, they were the only silver lining to this whole story. After collecting a few details, they told me to take the car to a body shop right away and get an estimate so I could get it back as quickly as possible. They also apologized profusely and assured me they'd pay for every penny of the damage. Unfortunately, "every penny" is going to be rather pricey. I haven't gotten the estimate back from the collision shop, but I'm guessing $2,000 total for a new taillight, a new panel, paint, and labor – and another $2,000 in diminished value from a hit on the Carfax report. Call it the $4,000 mistake. Or $4,007, if you include the tip. But the mistake isn't what annoys me most. What upsets me is that the valet didn't see fit to tell me he had damaged the car, leaving me to discover it on my own, the next day. If you tell me right then, it's an accident. Accidents happen to everyone, including me. Just ask my former employer. But if I find out later, it's a malicious cover-up; the result of a valet who's scared for being fired when a SnapChat-while-reversing session didn't go as planned. And that's why, from this moment forward, I will never turn over my car to a valet again. Oh, sure, I will visit restaurants with valet parking. But I will bring my Nissan Cube, in all its scuffed, scraped, dog-smelling glory. A valet could damage that thing and I'd never notice. I might even thank him.